The Perinatal Mental Health programme has been designed to help educate and increase awareness of issues arising from mental health. This programme deals with two small projects, Perinatal Mental Health for Health Visitors, and Perinatal Mental Health. The latter project has recently been added as a result of the Mental Health Awareness Programme, which includes e-learning from several projects, all focused on increasing awareness of Mental Health in different disciplines. In the Health Visitor Implementation Plan 2011-15 – A Call to Action, published by Ministers on 8 February 2011, the government committed to developing a larger, re-energised health visiting service. The Health Visitor Implementation Plan contains core aims to “improve opportunities to use the full range of health visitor skills and re-emphasise health visitors as key public health professionals” and to “ensure a strong focus on responding to differential needs and improving outcomes, and that systems promote effective join-up between services in ways that best meet local needs”. Training Health Visitors to identify and treat postnatal depression, including making referrals to specialist counselling, is a key driver of these aims. Training Health Visitors to identify and treat postnatal depression was the focus of a major announcement by the Secretary of State (May 2012), with the Department of Health press release stating “these key healthcare professionals will be able to access new evidence and training so they can identify and support women with postnatal depression”. Postpartum depression is currently poorly identified and therefore often untreated, and therefore is a significant area for public health improvement. Training of Health Visitors is an effective intervention to bring about this improvement. The Department of Health have mandated Health Education England (HEE) to develop an e-learning resource in the field of Perinatal Mental Health. HEE has developed a set of five 20 to 30 minute e-learning sessions. The sessions assume no prior knowledge of perinatal psychiatry and are designed to be accessed by any health care professional that has contact with a mother or baby from the period prior to conception until the child is 1 year of age. All content is referenced and the learner is signposted to additional detailed learning resources for more advanced learning. The content and structure of the sessions were formally agreed during a stakeholder consultation exercise in May 2015. This included input from several Royal medical colleges including the RCN, RCGP, RCOG and RCPsych amongst others. HEE commissioned the Tavistock and Portman NHS Foundation Trust to develop a skills competency framework for all staff working to support mothers and families across the perinatal care pathway, from preconception to postnatal care. The framework is designed to increase general awareness of perinatal mental health disorders and associated care skills, supporting advanced and specialist practice. Competencies are the skills, knowledge and behaviours that deliver high quality care and enable the continuous improvement of services. The framework has been developed to standardise competencies for perinatal mental health practice across England. This will help to ensure the workforce is confident and suitably skilled to identify need and deliver care to women who have mental health problems during the perinatal period, thereby increasing access to appropriate evidence-based specialist treatment. This framework lists several competencies over separate domains and is divided into categories for different types of healthcare worker; including those who have limited infrequent contact, to those who work in specialist perinatal services. Over time, this competency framework may be used for recruitment, training and development, and discussions about career progression. If you already have an account with e-LfH, then you can enrol on to the Perinatal Mental Health programme by logging in to the e-LfH Hub, selecting My Account > Enrolment and selecting the programme. You can then access the programme immediately in the My e-Learning section. The Perinatal Mental Health programme is also available to NHS healthcare staff via the Electronic Staff Record (ESR). Accessing this e-Learning via ESR means that your completions will transfer with you throughout your NHS career. 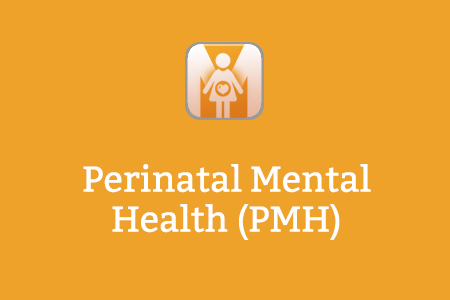 The Perinatal Mental Health programme is freely available to access here.